Yarn: Rowan Calmer #475 (75% cotton, 25% acrylic), 3+ x 50g balls (175yds each). This is a very comfortable and stretchy yarn. It does tend to split, but is otherwise a dream to work with! Notes: I've lost the notes I was using as I went along (the project was abandoned for about 1-1/2 years), so I'm afraid you'll have to settle for a very sketcy tutorial. This is knit from the top down, all in one piece in the round. The very top part is inspired by Grumperina's Picovoli. There is a row of seed stitch (alternative knit and purl) at the very top. I think I did some decreases on the edge of the "sleeve," to achieve a rounded fit rather than having it flare out. There is also a row seed stitch just before binding off the "sleeve." I put a few increases over the chest area (I'm afraid I don't need much!) over several rows. I did this from 4 points distributed across the front, rather than increasing along the sides. Under the bust, I did one row with multiple decreases distributed across the front, so that there is a slight gathering effect under the bust. Then, 3 rows of seed stitch, just on the front, so visually set off the cables. Over the belly area, there are 2 sets of cables, meant to look a bit like lacing for a corset. I did some waist shaping along the sides. Towards the bottom, there are 3 rows of seed stitch, this time on both the front and the back. 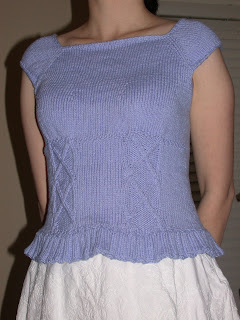 The ruffle at the bottom is a 4x2 rib. I did one row of knitting into the front and back of 2 stitches and then purling into the front and back of the next stitch, repeating that all the way around. This resulted in double the number of stitches and set up for the 4x2 rib.